Any time you have a bathroom remodel, it is important to make sure the existing materials in the bathroom will coordinate with the new design plan, and also maximize potential resale value. The existing vanity in this home in Raleigh was functional, but the homeowners wanted to consider updating the top. The cost to replace just a vanity top compared to replacing the entire vanity with an updated style made perfect sense in this remodeling plan. The divider wall is reduced to a knee wall, allowing light to come in through the existing picture window. The shower size is extended nearly to the end of the new knee wall, and a tall custom frameless shower enclosure is installed. Tile on the bathroom floor is replaced. All of the new tile in the bathroom is selected specifically to coordinate with the existing tile around the bathtub, eliminating the need to replace the tile around the tub and reducing the overall remodeling cost. The end result is spectacular! This homeowner now has a larger, open shower using large subway tile for a dramatic appearance, a shower niche, and an amazing frameless shower enclosure. The homeowner no longer has to worry about ducking into the shower! The bathroom floor tile is installed to the back of the vanity wall to accommodate a furniture style vanity. 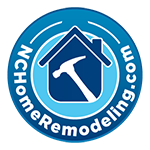 Call or click NCHomeRemodeling.com in Raleigh for your next bathroom remodel. 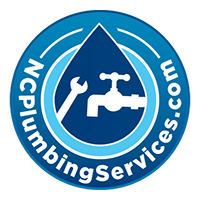 We work in Apex, Morrisville, Raleigh, Cary, Wake Forest and throughout the Triangle of North Carolina. Use our contact forms on this site or call! No Replies to "See Our Work: Classic Bathroom Remodel Project in Raleigh"